Nihilent, a global consulting and solutions integration company, has announced the official opening of its first user experience (UX) lab on the continent, it is the only other such facility outside India and second globally. 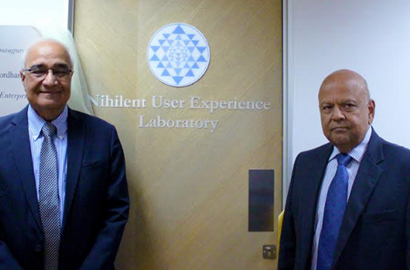 The Lab was inaugurated by the Honourable Minster of Public Enterprises Pravin Gordhan. The lab offers an ideal setting to innovate, drive a deeper understanding of customers and build products and services that create an emotional connect with the users. The lab uses a patented design thinking framework and analytical tools to identify cognitive, and emotional triggers as well as non-verbal modalities of user experience with the goal of further humanising the interaction between users and technology. The lab is home to multidisciplinary teams of right and left-brain professionals working closely with customers to continually enhance user experience. Located at Bryanston in Johannesburg, the lab has a start-up like feel to stimulate innovation and foster creativity. It caters to all type of businesses and verticals B2B and B2C for product/content validation, driving projects, facilitating design workshops and bringing to market the next big disruption. The massive adoption of digital technologies, exponential increase in connected individual and devices has given rise to a new type of economy. Millennials today hold the potential purchasing power and are spending more on experiences rather than just services. Fueling this economic shift is social media – a medium that lets everyone showcase and share their experiences, making these moments tangible and worth returning for. The experience economy is one of the biggest and most significant global trends that reflects consumers’ changing attitudes and expectations. Nihilent uses design thinking to deliver a personalised and enthralling experience. The process starts by first providing utilitarian functionalities and progresses to ensure features are easily and readily accessible by the users. Once the basics are in place, the company uses heuristics and quantitative assessments to work towards making these interactions pleasurable and meaningful. Companies across diverse industries are beginning to realise this and are starting to embrace UX as a philosophy.